I’m back! It has been months since I had a new blog post and for that I do apologize. However, there are no excuses. I simply wanted to take a break and so I did. There! This summer was filled with a move to the west coast, and fantastic visits from family and friends! We are certainly adjusting back to being on the west coast with ease. We can be found kayaking, hiking, biking and enjoying the general beauty of the Central Coast of California. Mix all ingredients and enjoy with toast, over a bed of lettuce, add raw goat cheese, or devour as is. 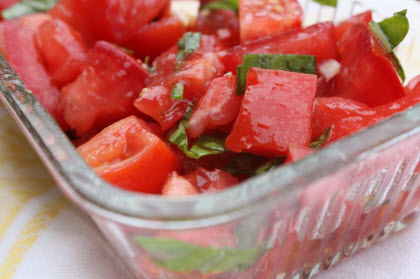 Click on Salad Recipes for some more scrumptious salad ideas.